Menjō Ieteru, ?-1583 (here Menju Sōsuke Ieteru) became a page of Shibata Katsuie at the age of twelve. At the battle of Ise Nagashima, the golden gohei standard of Katsuie was seized by the enemy. Ieteru, then only sixteen years old, asking Katsuie not to risk his own life, retrieved the gohei from the enemy lines and safely brought it back. Katsuie was so pleased that he decided to give part of his name ‘le’ to Ieteru. Later, Ieteru often acted as a double (kagemusha) for Katsuie holding the golden gohei standard in order to deceive his enemies. 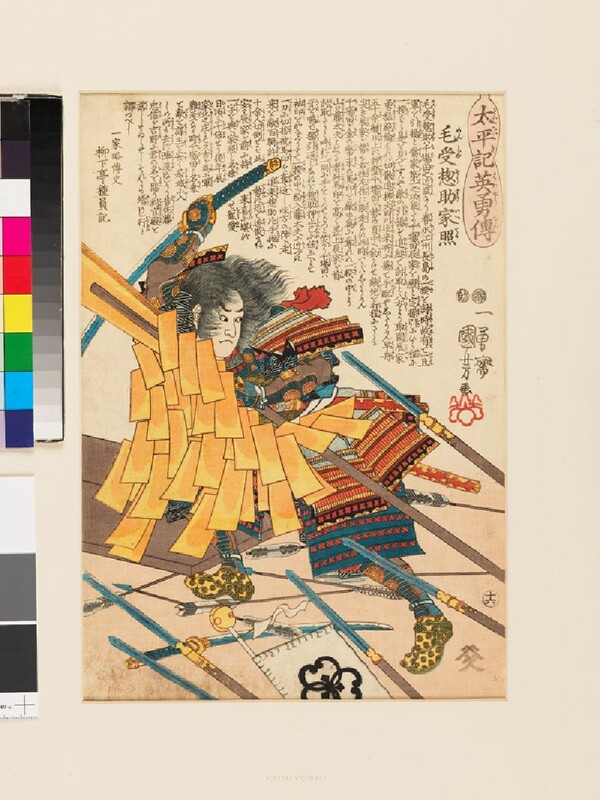 This print shows Ieteru fighting furiously against many enemies, only depicted here by their spears, swords and arrows, trying to retrieve the standard.